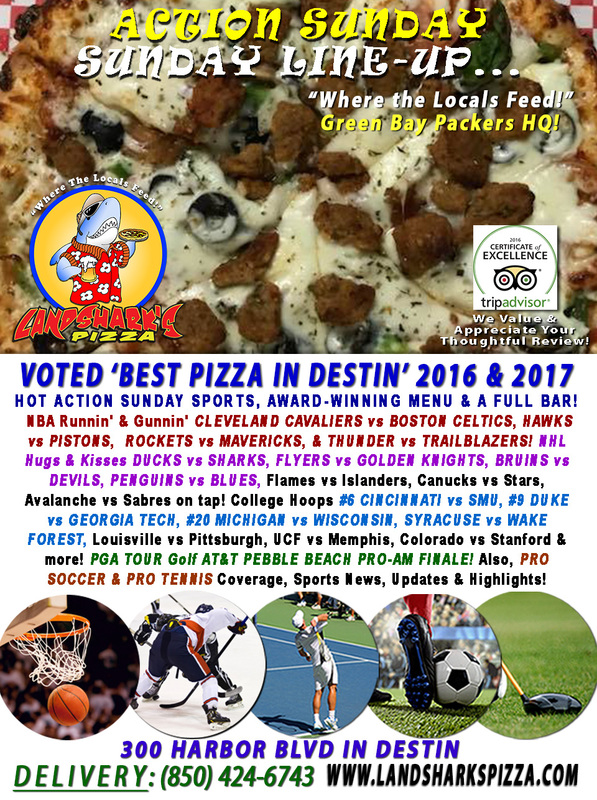 / Best Burger Deal in Destin FL / Sizzling Burgers & Brew Monday Special $9.99|NORTH CAROLINA vs NOTRE DAME & Craft BEER TASTING@6PM!NHL, NBA & more! Sizzling Burgers & Brew Monday Special $9.99|NORTH CAROLINA vs NOTRE DAME & Craft BEER TASTING@6PM!NHL, NBA & more! No groggy, sleepy rollin’ outta bed today – CARPE DIEM some awesome chow here at Shark Central! 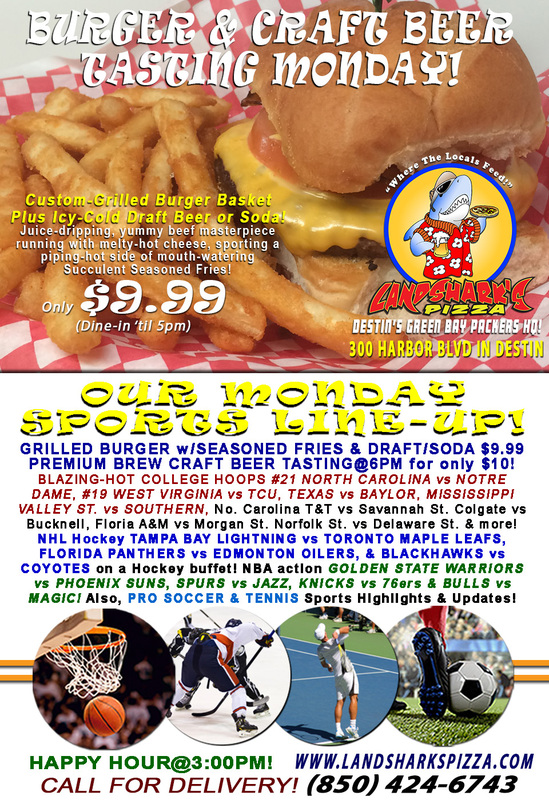 It’s all about great taste & high-paced action in Destin on Burger & Brew Monday at Landshark’s! Put your taste buds on notice – IT’S TIME TO GET DOWN TO WORK! Wrap ’em around A melty feast accompanied by succulent seasoned fries & your choice of icy-cold Draft Beer or a flavorful Soft Drink for only $9.99 (’til 5PM)! 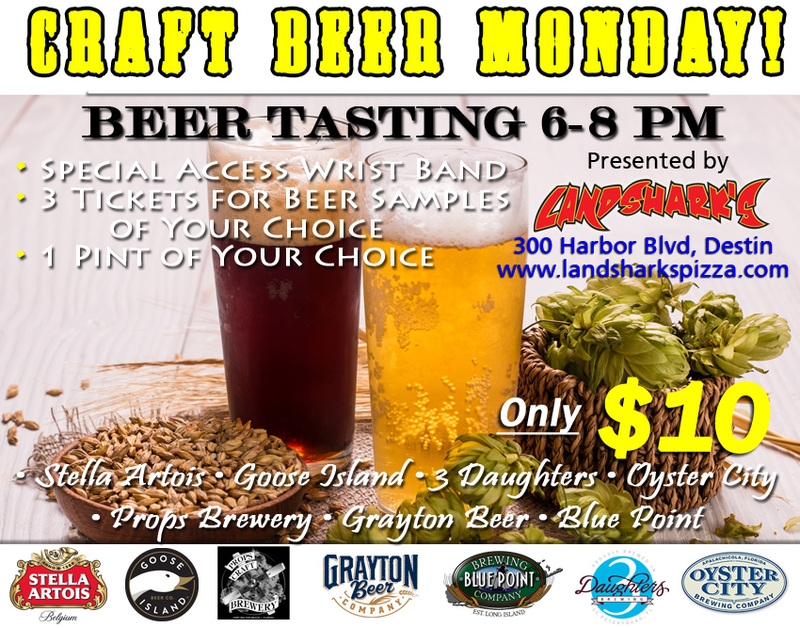 PREMIUM CRAFT BEER TASTING at 6PM – Join in for ONLY $10 – Includes All-Access Wristband, 3 Tickets for sampling the Craft Beer Monday selections of your choice, 1 Full Pint of the Craft Beer of your choice! FEELING ONE WITH YOUR COUCH? NO PROBLEM – ALL FOR DELIVERY! WE DELIVER 5 to 9PM DAILY except Taco Tuesday! HOT SPORTS ON OUR ARMY OF BIG SCREENS – NBA Basketball GOLDEN STATE WARRIORS vs PHOENIX SUNS, SPURS vs JAZZ, KNICKS vs 76ers & BULLS vs MAGIC! NHL Hockey buffet TAMPA BAY LIGHTNING vs TORONTO MAPLE LEAFS, FLORIDA PANTHERS vs EDMONTON OILERS, & BLACKHAWKS vs COYOTES! Blazing hot College Hoops #21 NORTH CAROLINA vs NOTRE DAME, #19 WEST VIRGINIA vs TCU, TEXAS vs BAYLOR, MISSISSIPPI VALLEY ST. vs SOUTHERN, No. Carolina T&T vs Savannah St. Colgate vs Bucknell, Floria A&M vs Morgan St. Norfolk St. vs Delaware St. & more! Also, PRO SOCCER & PRO TENNIS coverage, Sports News, Highlights & Analysis! Pro Tennis This Week: ATP World Tennis Tournament, Argentina Open, & New York Open! NASCAR This Week: DAYTONA 500 (Sunday Feb 18th) Duel #1 & Duel #2 on Thursday the 15th! WANNA STAY DRY? CALL FOR DELIVERY (850)424-6743! 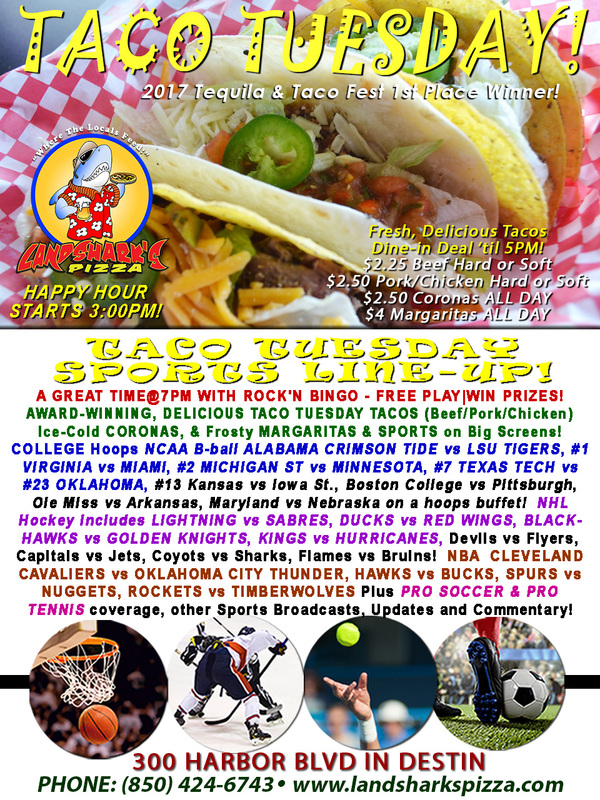 Previous Post: « Landshark’s Action Sunday CAVALIERS vs CELTICS, Red-Hot NHL & Fastbreak NCAA Hoops, Great Menu & Full Bar!